Ogden on Politics: Trump Calls Using Eminent Domain to Take Private Property for Developers a "Wonderful Thing"
Your complaint is? Eminent Domain is in the Constitution? His example of "highways" quite fits PUBLIC USE. The Masonic courts have lied to us and "expanded" that (wrongly in the view of most) to "economic development". Is Trump wrong to rely upon the SC's stupidities? Hmmm would you say the same thing about Everson stupidities? Recall, too, that Learned Hand long mocked the poor legal reasonings of the Supreme Idiots.....R v W comes to mind as well as Justice Stoopid Kennedy (good reason for suspecting R's of not being very smart about judicial appointments). If you don't respect private property, you disavow the basis of all liberty. It's fundamental. The TRUTH will come out about him at some point and he will drop like a rock. Well, there are drawbacks to a "living" Constitution among which is having Masons (or others) substitute their views for those of the Founders and then lie about it. Some political parties don't have much use for private property, Communists, for one, Socialists, for another, and, of course, Democrats who have DNA from both of those political parties. To the extent that R's are moderate to liberal they also drink from that well or "tolerate" the theft of private property. If the R's have repudiated KELO'S MAJORITY opinion I don't think I saw that in their political platform nor in any federals laws passed by Republicans to overturn what is generally accepted by folks as being the law of the land. So, how is it that Trump is being vilified for following the very expensive, no doubt, advice of his lawyers? Virtually every Republican on the planet has repudiated Kelo. Many legislatures have adopted measures to limit the effect of Kelo.. The notion that Trump was just follows his attorney's advice is just, well, sillly. The fact is Trump supports Kelo as policy then and he still supports it now. Stop making excuses for him. Any other candidate who took this position you would be all over that person. But lwuth Trump you want to give him a pass. No way. Trump is a liberal who has no respect for private property rights. Virtually every Republican on the planet has repudiated Kelo. Many legislatures have adopted measures to limit the effect of Kelo. The notion that Trump was just following his attorney's advice is just, well, sillly. The fact is Trump supports Kelo as policy then and he still supports it now. Stop making excuses for him. Any other candidate who took this position you would be all over that person. But with Trump you want to give him a pass. No way. Trump is a liberal who has no respect for private property rights. Talk is cheap and one need look no further than the Indiana Legislature and Gov's office to record as much cheap talk as you could stand. While Dana Berliner judges Indiana's reform as "effective" that could only be in relation to the efforts of other states since we continue to see abuses in Indiana. For instance, Hiatt v. BSU where BSU decided that training folks to run a motel would be a great investment in higher education but they needed to steal HIatt's property first. Oh, it is also thought that they would first attempt to destroy his business, and also lie throughout the whole process......I think the ruse was that they directed that all printing be routed to their own print shops instead of the more competitive private sector ones including Hiatt Printing located across the street from their Ad Building. Anon 3:33, if you're against BSU stealing Hiatt's property, why in the world do you support Donald Trump? Eminent domain is done almost entirely at the state and local level. Our Republican Indiana legislature did change the law in response to Kelo. As far as reversing Kelo via new appointments' to the Supreme Court that takes time. That idiot Donald Trump is clearly wrong on eminent domain. Stop giving him a pass. To this day, he supports being allowed to us eminent domain to take little old ladies' property for his casino. Trump has ZERO respect for private property rights. No Republican who believe in private property rights should be supporting him. Whatever the Indiana Legislature did in changing the Indiana law it didn't stop the theft of Hiatt's property. The point being made was that R's talk and they talk big but produce small and they produced on the cheap in Indiana as far as Hiatt was concerned. KELO got to the SC...so I assume there was a federal question just as there was in the previous cases at the SC level. Congress can pass laws about Eminent Domain or they can remove the Court's jurisdiction over same. The R Congress has done nothing. In this, they mirror the R's of Indiana. Plus, KELO is a 5-4 decision upholding what you say is wrong. Hmm. How was Trump so clearly wrong if he had five SC justices serving his lunch to him? Since when does a candidate for President of the US justify his/her beliefs about the Constitution & cite his "lawyers" as a basis thereto? The dude is a statist, just like 95% of all politicians. There are lots of issues and on the basis of one of them you are seeking to exorcise one candidate whose sin was to agree with the Supreme Court's majority decision in KELO. There are other issues like illegal immigration where, say, 45,000,000 illegals have come in to take over the country. Which Republicans said a word about it prior to Mr. Trump's holding their noses in it? Why, Jeb, of course, he wrote a whole book on Amnesty....and I suppose ole Marco Rubio gots him an autographed copy so he could get some of that $70,000,000 the Chamberpot of Commerce is said to have expended or will expend in order to get the illegals made legal. So, since Jeb and Marco are both tools and, "clearly wrong" what other R candidate is worth listening to? Anon 9:01, the Constitution is the floor on our rights, not a ceiling. One can always advocate more protection for homeowners via statute. Trump doesn't do that...he's perfectly fine with big developers utilizing the power of government to take away private property. And Trump could also have opted to not personally be involved in taking away a little old lady, a widow's property, no less, for parking for his casino. He aggressively and shamefully did that. Leon, Trump is not "the current choice of most Republicans." He's the current choice of a plurality of Republicans, far, far below 50%. We have a great chance to win the White House, yet some in the Republican Party want to nominate Trump, a big government, corporate welfare-loving liberal. Trump also wants to continue funding Planned Parenthood (he says he is "very pro choice, even supporting partial birth abortion) and is for universal health care, an expansion of Obamacare Fortunately, I doubt Trump gets anywhere close to the nomination. If he does win the Republican nomination, say hello to President Hillary Clinton. This great chance....what is in it for folks of a conservative bent? Would it be the usual Indiana R tactic of "we need your votes" and then "you have nowhere else to go"? As I recall, Romney had a great chance but due to Rove and his own stupidity failed to connect with Palin until the day or two prior to the election.....when he finally saw his polling numbers had been jiggered and his future was the electoral toilet. Which of your R candidates are making solid promises? None of them ever have unlike Mr. Obama who lies, cheats, steals, and mouths off about it but delivers to his radicals what they want. Anon 11:33, are you kidding? CNN has given Trump tons of publicity. Something like 87% of the coverage has been of Trump and 13% of the other 16 candidates. Facts are facts when it comes to Trump's position on eminent domain. The fact it's reported by Fox News or CNN or any other network doesn't matter. 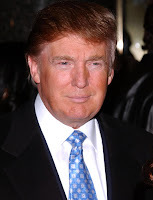 Trump needs to put on his big boy pants, and stop complaining about the media, if he's going to run for President. Anon 8:28, so because we've been disappointed in the past, we conservatives should instead vote for a liberal big government until 2012 Democrat, Donald Trump, instead? A man who is for expanding Obamacare to include everyone. The same man who said he is "very pro choice" and doesn't have problem with partial birth abortion and wants to continue funding Planned Parenthood? A man who has no problem taking private property for developers? A man who has supported the Clintons and Nancy Pelosi with words and campaign contributions? So, we conservative anti-Establishment Republicans are supposed to walk up to the Establishment GOP and threaten to blow our brains out by nominating the most liberal, big government candidate in the field? And that makes sense? Leon, Republican candidates for President talked about immigration all the time, long before Trump arrived on the scene. Trump has added nothing to the debate, except ridiculous proposals that would never pass, would never work, and would cost taxpayers a fortune. Unfortunately too many of my conservative friends have no interest in fixing our broken immigration system. Enforcement by itself solves nothing. Not every comprehensive fix is "amnesty." Mayor Greg Balland's executive Department of Public Works has declared, in writing, that it possesses the legislative power of Eminent Domain, and DPW has illegally seized parts of platted subdivision lots for the construction of walking paths and purported public roads, in circumvention of subdivision control statutes and Indianapolis ordinances which mandate public hearings for Resubdivision of Land. Under the police power delegated by the state of Indiana to the Metropolitan Development Commission Plat Committee, no expenditure of public funds is required to resubdivide platted lots. Without any City-County Council or Board of Public Works Resolution declaring the necessity of the taking of private property for public use, the Department of Public Works has executed payments to certain lot owners for parts of their platted lots.